As many of you know I’m a big fan of the crazy looking plant Harry Lauder Walking Stick. The true beauty of this plant is it’s crazy contorted branches that can’t grow straight if they tried. A few years ago we planted hundreds of these in the nursery and we’ve since dug them all up. Some we’ve potted up to sell, the others will be potted soon. Right now we are in digging mode so at the time we have hundreds of plants heeled in waiting to be potted. So the purpose of this post is to make you aware of a few things. 1. There is a disease that attacks Harry Lauder Walking Stick. This is how you detect it. 2. Harry Lauder Walking Stick can be trained to grow as a single stem tree. I show you how to do that here. 3. You can propagate Harry Lauder’s Walking Stick at home via layering. I show you how to do that here with more Harry Lauder Walking Stick Photos. Here are some photos of the Harry Lauder’s. Mike McGroarty with his Harry Lauder’Walking Stick heeled in. I love this photo! How about you? We do not ship plants! All plants are sold on site at the nursery in Perry, Ohio. We usually have big weekend plant sales in May. Giving back really isn’t a lost art, I see it daily in our members area, http://backyardgrowers.com/join, people helping people on a daily basis. My dad had a lovely walking stick that was getting a bit late for its location. My brother decided to cut it down. Dad is gone and I’m in his house. Dozens of saplings have grown back and I’ve removed all but two, about 6 foot each. They are all straight, no gnarling of the trunk or branches and the leaves are not as frilly as before. I wish that I’d found your article before trimming. Can I encourage the to that I’ve kept to the familiar gnarled shape or should I cut those down and start with new shoots when they emerge? Remove the straight shoots. I no curly shoots appear I’d consider the plant of no use and remove it completely. I am zone 5, live a mi from Lake Erie upstate NY. Have a 25 year old Harry Louder Walking Stick. 2014 was an awful winter but that spring it leafed out and seemed fine. Last winter,2015 – 16 was not so bad and this spring it partially leafed out. Some of the branches were fine but others dropped their tiny leaves and seem to have died. So I have sparse leaves on top (7′) and some new growth coming from the base. Do I just cut the dead stuff…. cut it off the top half… wait and see???? HELP and thank you in advance. Your Harry Lauder’s might be in more trouble than you think and if it’s infected it probably cannot be saved. I don’t know how you do it! You answer e-mails, make videos, write for a magazine, AND run your business. You must have a clone. My nursery bed is overrun with chickweed and other volunteers. Spent two mornings just trying to clear out the weeds. And a morning of that is all the aging body can handle. Do you have a secret to keep your beds weed free, or do you hire a boy scout troop? Had one of these for several years in my landscape. The Japanese beetles loved it so after several years I removed it. I must say the foliage wasn’t anything special but in the winter the contorted limbs were pretty neat. I wouldn’t have removed it because of Japanese beetles. Yes, they do love the leaves, but I would have treated for beetles and left the plant. Thank you Mary, my late father was born in Ireland, moved to the U.S. around 1948.
mike would this tree be related to a cork screw willow? No it is not, smaller plant, in the filbert family. I can’t get a Harry Lauder Walking Stick anywhere. The girl closest to me was in Oregon (I am in Northern California) and she says she won’t be selling any for a long time due to budding or something I don’t remember. I have no clue of anyone in Ohio for your plant sale so where would I find one that won’t break the bank? I absolutely love them, always have. Debbie, I just told somebody else to look on ebay, I have a member that sells some there in the spring. You are the best Mike. I’m glad to see that others truly appreciate all your advice and your happy ways. Also good to know that kids are benefiting from all you give so freely. Fell off a 6 foot ladder two weeks ago…busted my wrist up bad. Emergency surgery, 7 screws and a metal plate. If you hadn’t have given me so much fall clean-up advise….I’d be in an even worse mess. Thank you, so much, for all you do for so many of us. Still having brutally cold weather, here in New England….and my perennials all look sickly from it. Also strange weather all over the country….I feel SO bad for those who count on their plants for income. God bless us all…. Thank you for your kind words and I’m truly sorry to hear of your fall and injury. The weather has been crazy but all we can do is roll with it. Dear Mike im wanting to know what do you use to kill the bugs off your plants ive been reading your newsletters . i have around 150 of different bushes that ive started from cuttings like you taought me. I rarely if ever use an insecticide in my nursery. I find that small plants that are healthy and happy tend to fight off bugs pretty well. Those are some pretty awesome looking plants! Just curious if they leaf out or are always just the bare wood? (That would be a real oddity)! Thanks for all you do to help us less than green thumbs out here! They leaf out with rather strange looking leaves. I HAVE THREE DIFFERENT DOGWOOD TREES THAT HAVE HOLES THRU THE BARK AND SOMETHING HAS GOTTEN UNDER THE BARK AND TURNED IT INTO POWDERY CHALK LIKE IN DIFFERENT AREAS. ANY IDEA WHAT IT COULD BE AND WHAT I CAN DO ABOUT IT? Your description sounds like the dogwood borer. It is a common pest of older or stressed flowering dogwoods. Google it for more information.. Zone 5-8 on the Corylus Contorta. Beautiful singles Mike! FREE information! I would like to know if these walking stick plants can be made into actual walking sticks? I live here in Tucson, Arizona, and we have a lot of seniors that would like to have unusual walking sticks just a question. Thanks! I’m way down here in Sierra Vista. Moving up that way next month. Do you have a veggie harden going yet? If so, what stage is it now? Trying to get used to Arizona gardening. I’m a Michigan transplant. Mike, I have followed your videos about prunning, planting hardwood cuttings and so on. These pointers and techniques are essential to the garden world. Just like to say “thanks” for what you are doing because this has encourage me to involve young people with the same passion for plants as I have. Mike. I have followed along with the videos about prunning, planting hardwood cuttings and so on. These techniques are essential to the garden world today and what you are doing has inspired me to encourage young people to get involve as I continue my love for plants. I would like o order your book for my daughter who lives in Seattle. She is a much better gardener than I am. I live in Texas, where we grow Cactus, thistle, and weeds. I have been trying to take care of our yard, have a garden and keep a lawn, all of which I know nothing about. I love your newsletters and read and listen to the videos, but feel that I’m too old to really get into this, now, as I have a new hip and also we live on a ranch and the pasture weeds just come into the yard and drive me crazy! Anyhow, I would like you to tell me about how I can get your book soon, as my daughter will be here in June. Mike, Thank you for all your videos, ideas and knowledge for us to learn from. 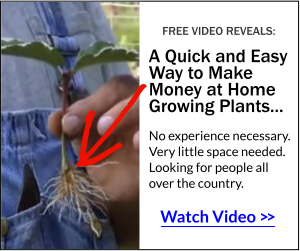 I appreciate you knowledge on so many plants and trees, that I hope that when we get our “square” of land, probably in San Antonio, we will be ordering from you so we can make that “retired” money. That’s fine, when you’re ready I’ll be here. I’ve been doing this online for 14 years and won’t be going anywhere soon. You are welcome and thanks for sticking with me. Totally intrigued with today’s offer for $7. I am not sure but seems between the lines I “read” if buying the report there is a Step Two of what you are bringing or will be offering that works in tandem with the report. Yes? I am trying to kick start a business for a friend doing this. 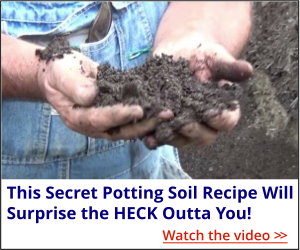 Perfect for folks that are struggling on disability but fit in body to do the soul heartening work in the garden….and the blessing of some additional income to supplement their fixed income.